Around 1:00 pm, we headed down town for some lunch. 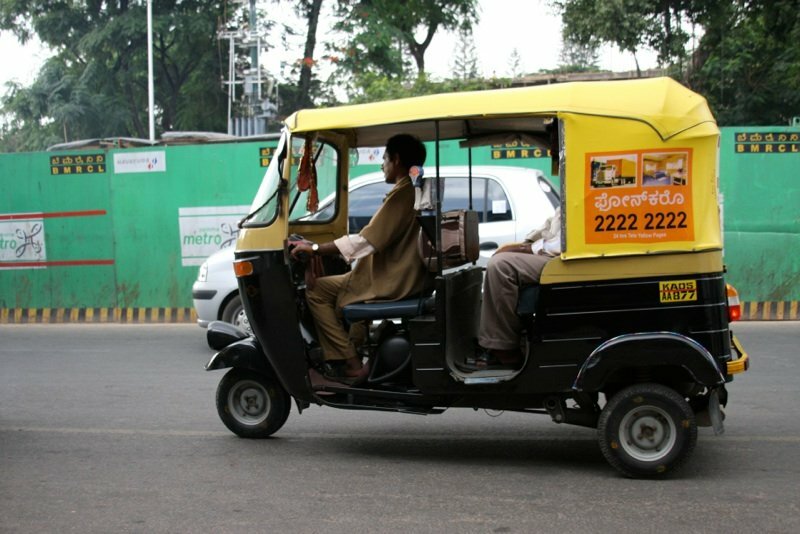 This was really exciting because it was our first adventure on the “auto-rickshaws”. Though these vehicles are only meant to hold two adults comfortably, we’ve seen up to seven people packed into one! Which is astounding since they have about the same power as a crappy golf cart… Top speed is probably around 40 mph, but that feels really fast considering you are inches way from cars, scooters, and other rickshaws at all times. While I’m at it, we saw four people riding on a Vespa Scooter (3 adults, 1 child) the other day and today I saw two guys on a scooter, with the guy on the back was carrying a big microwave!!! After lunch, we hung out at a coffee shop and then toured around the city. While cruising around, we stopped by the largest Mosque in Bangalore. Unfortunately, we couldn’t go in because the guys were wearing shorts and women aren’t allowed in. So we took some pictures from outside and called it a day. On our way home, we saw our craziest traffic yet… At one point, we were stopped in the middle of an intersection, face to face with with two rickshaws, with hundreds of vehicles zipping around us in every direction, and everyone honking! No stress though… Nobody wears seat belts here as none of the vehicles I’ve been in have ones that are functional! I think the best description of Bangalore traffic is to think of a “bumper car rink” where nobody ever crashes… but with random cows walking around. It really is amazing.